We transport brand new and/or damaged vehicles such as estate, off-road, all kinds of buses and trucks, motorcycles, agricultural machinery, tractors, forklifts, quads. We work for international and national companies, local companies, private individuals, police, insurance and brokerage companies. From the beginning of launch, R&M International Poland has developed steady cooperation with its local and international clients. Moreover, the company has been expanding its scope with permanent services for many companies from both Poland and all over Europe thanks to its high responsibility of care for services. Our company is characterized by punctuality, speed, timeliness, care for entrusted cargo, delivery in indicated place. Thus, efficiency and immediate execution of the order have become our reputation. Our service includes picking up, taking over or repairing every vehicle from anywhere in Poland and Europe, transporting the vehicle to our parking lot or to the place chosen by the customer in the shortest time. We have a special fleet of transport vehicles that have been constructed for non-accidental loading, potential reloading and unloading, regardless of place and conditions in which vehicle is located. Our company is constantly developing and increasing the number of owned vehicles. The fleet is equipped with a GPS navigation system. 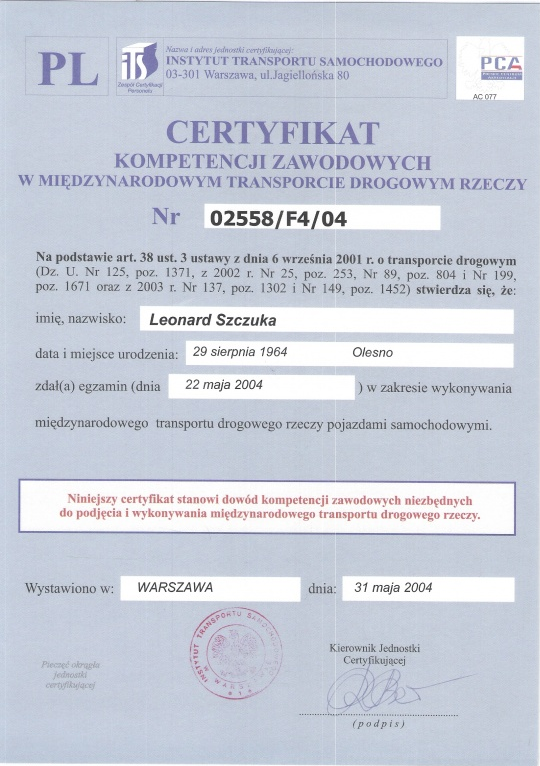 We have OCPD (Odpowiedzialności Cywilnej Przewoźnika Drogowego) which is a carrier liability insurance for both national and international vehicles in motion. The guarantee sums for each event in international transport amounts to EUR 350,000, and in domestic transport of 200,000 EURO. The insurance is included with one of the largest and oldest insurers on the Polish market – WARTA. 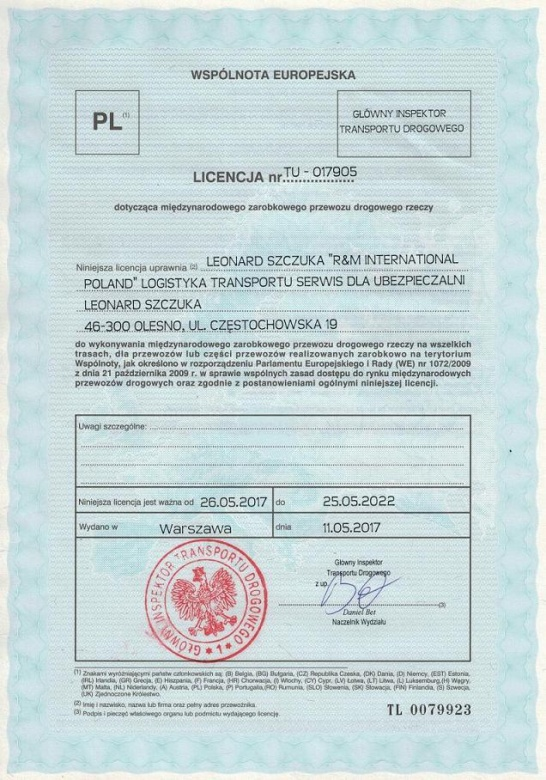 We operate on the basis of License No TU – 01795 for international executions for the transportation of goods.